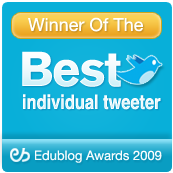 Blogging About The Web 2.0 Connected Classroom: Edublog Award Thank You! 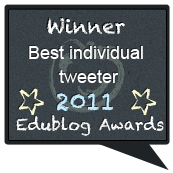 Last night was the Edublog Awards Ceremony. It was a wonderful experience to join Steve Hargadon, Sue Waters, and everyone else in Elluminate to hear the winners announced. There were so many awesome blogs, Tweeps, social networking services, audio and video sites that were nominated. If you have not already, head over to the Awards Site and check out all the nominees. You are bound to find some really awesome things! 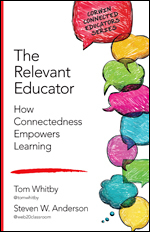 I just wanted to thank those that voted for me in the Best Individual Tweeter category and who voted for Edchat in the Most Influenial Series of Tweets. I did a short video this morning expressing my gratitude.